This exhibition is on display at Haus der Kunst, Munich, from 8 March to 28 July 2019. It is reportedly the largest European solo exhibition featuring an African artist. 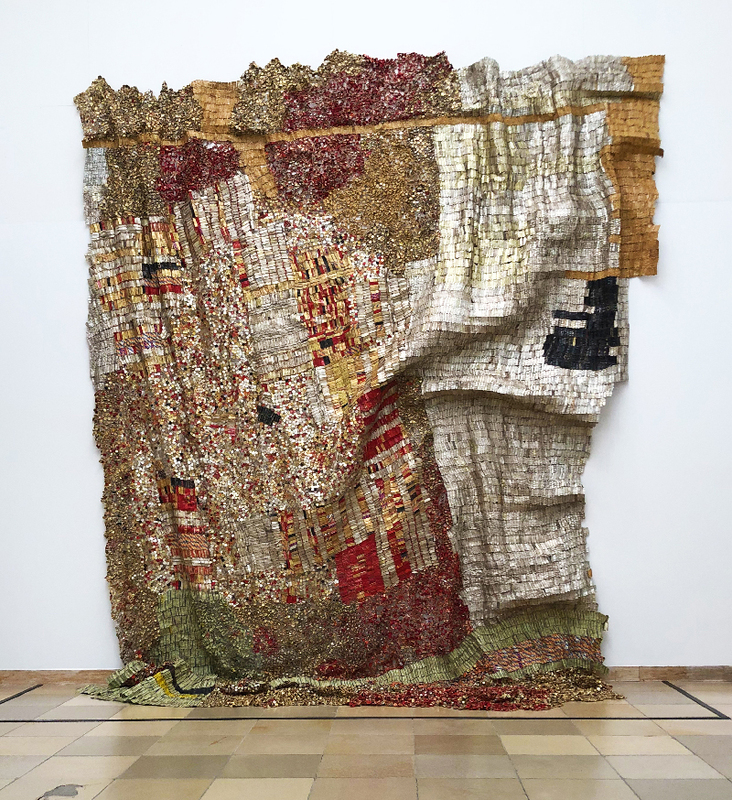 El Anatsui was born in Ghana in 1944 and lives in Nigeria. The exhibition was curated by Okwui Enwezor from Nigeria, the Director of Haus der Kunst until 2018. Originally named ‘Haus der Deutschen Kunst’ and designed by Paul Ludwig Troost, the huge building in the neo-classical style was the first architectural project to showcase National Socialist propaganda after its completion in 1937. In the post-war period, Haus der Kunst then very consistently focused on modern art. It is sad to hear that in the wake of an increasingly nationalist zeitgeist, there are voices in Munich in favour of the Haus appointing a director “who speaks German again”. 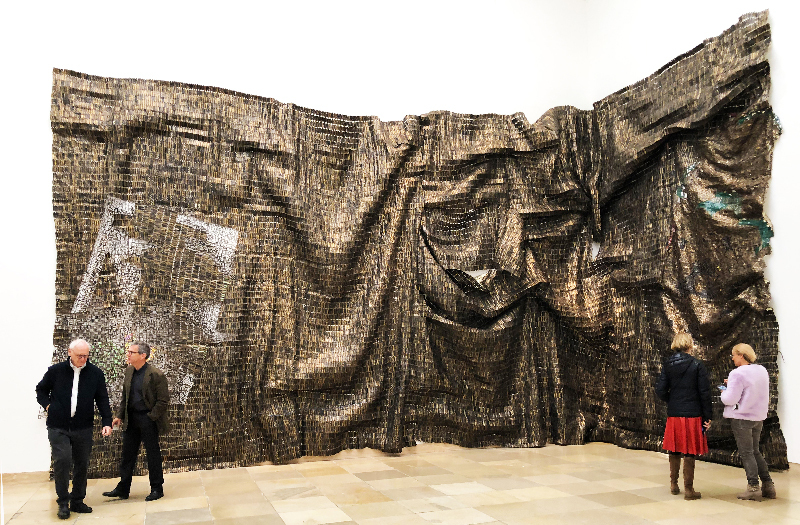 Visitors to the exhibition who have never been to Haus der Kunst before will be impressed, if not overwhelmed, by the dimensions of the rooms. 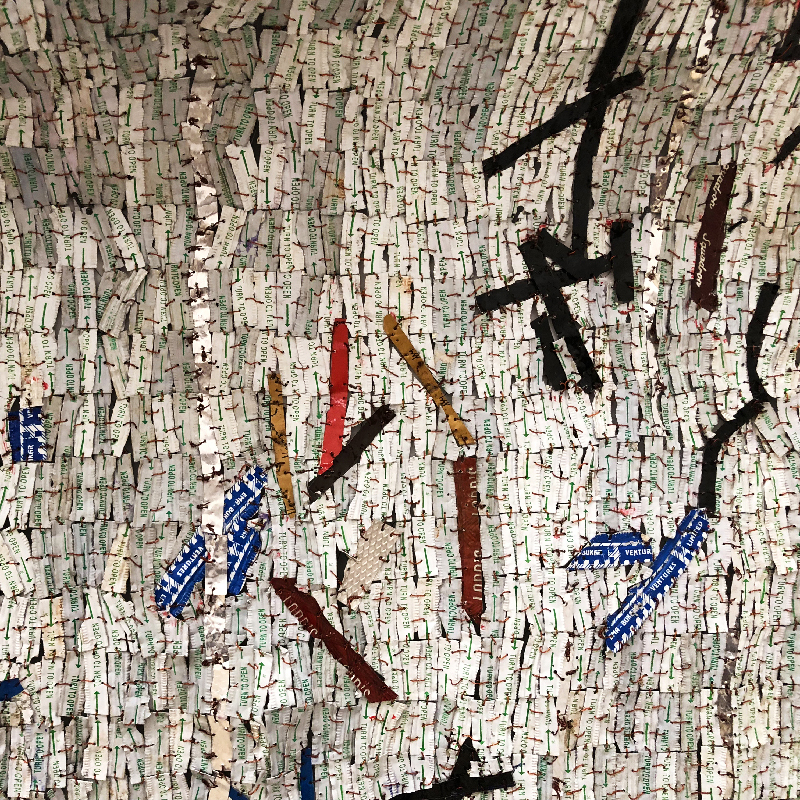 However, this effect vanishes in the El Anatsui exhibition. The artist not only fills the huge rooms with ease, but also gives visitors a sense of comfort by means of his large “cloths”. Although very big and heavy, his works are actually composed of small metal bottle tops which have been flattened, cut, twisted, rolled, squeezed and joined together with copper wire. His assistants make them up into coloured “blocks” which are then arranged by him and assembled by his helpers. 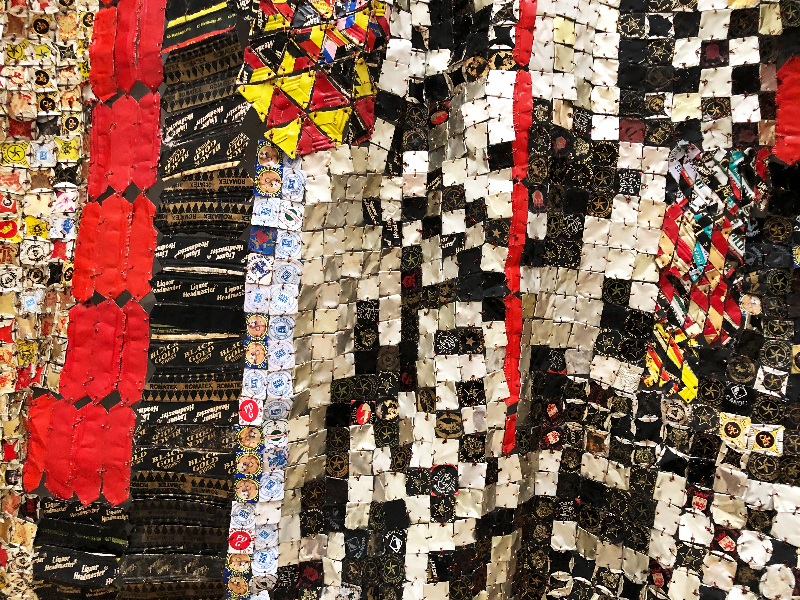 The way he works is similar to patchworkers; they, too, create their pieces from “blocks” and often work with found fabrics or fabric scraps. 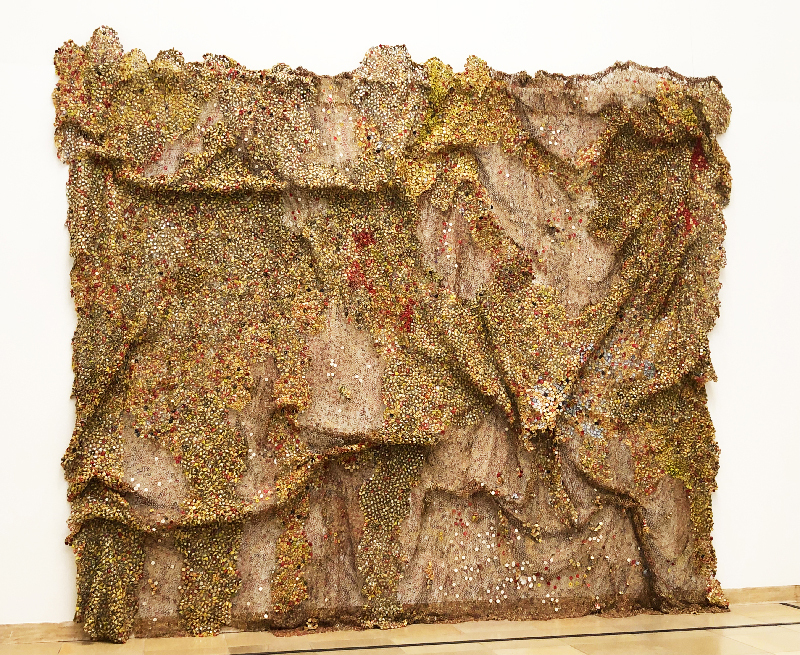 El Anatsui says that artists “should work with whatever the environment disgorges”. Furthermore, every artist should engage directly with their material (even if they need help in doing so). It is well known that he was inspired by the woven designs and graphic symbols found in Kente and Adinkra fabrics. 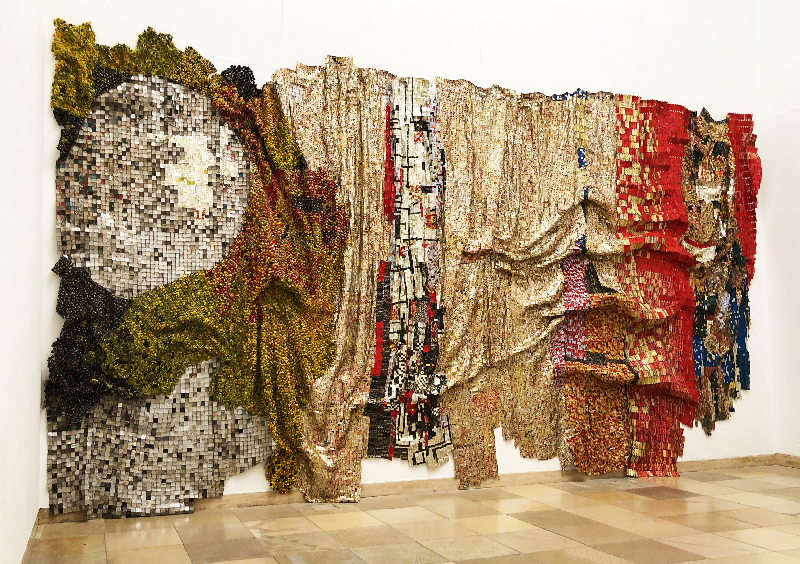 The textile context of El Anatsui’s work is also evident in titles such as “Man´s Cloth” or “Old Cloth Series”. 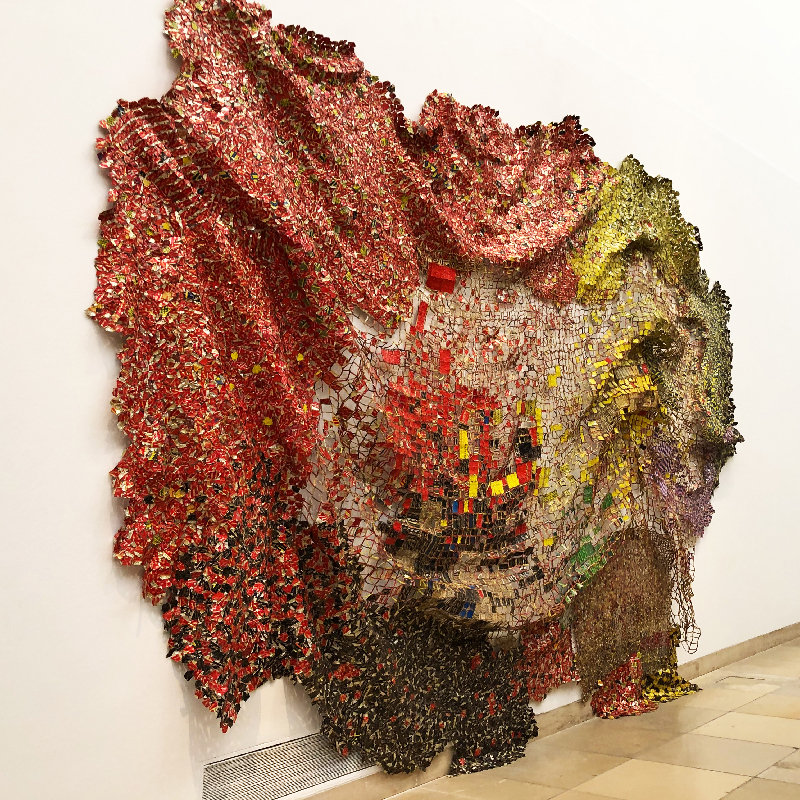 The “Art & Textiles” exhibition held in Wolfsburg in 2014 presented “Prophet”, a piece made in 2012. 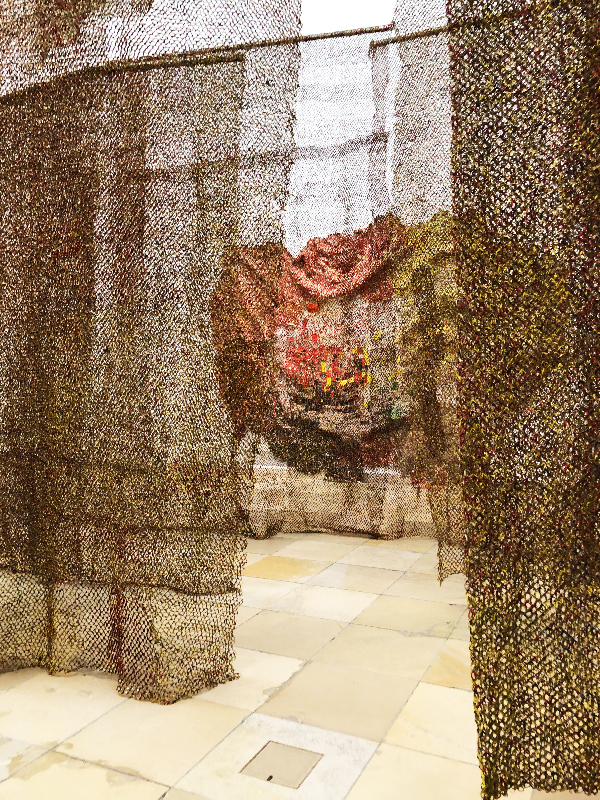 His huge “Logoligi” maze created for the central room is largely composed of thin rings (foil wraps for bottlenecks cut into strips), making the walk-in installation a great deal lighter than the heavy hangings draped along the walls in large folds. It clearly illustrates that the artist has addressed the monumental size of the exhibition venue. However, rather than daunting viewers with brick walls or fixed partitions, he has created lightness –light playing on material like sun shining through patches of fog, like a metaphor for the surprises of life. The installation is a substantially enlarged and modified version of “Gli” (Wall), an earlier three-dimensional installation from 2010. Next to his large “cloths”, the display also includes his earlier wood and stone sculptures as well as drawings. It is obvious that here, too, the artist works with smaller parts to design larger sculptures. Titles such as “Broken Pots” or “Pieces of Wood” illustrate this approach. The textile nature of his work struck me even in these pieces. 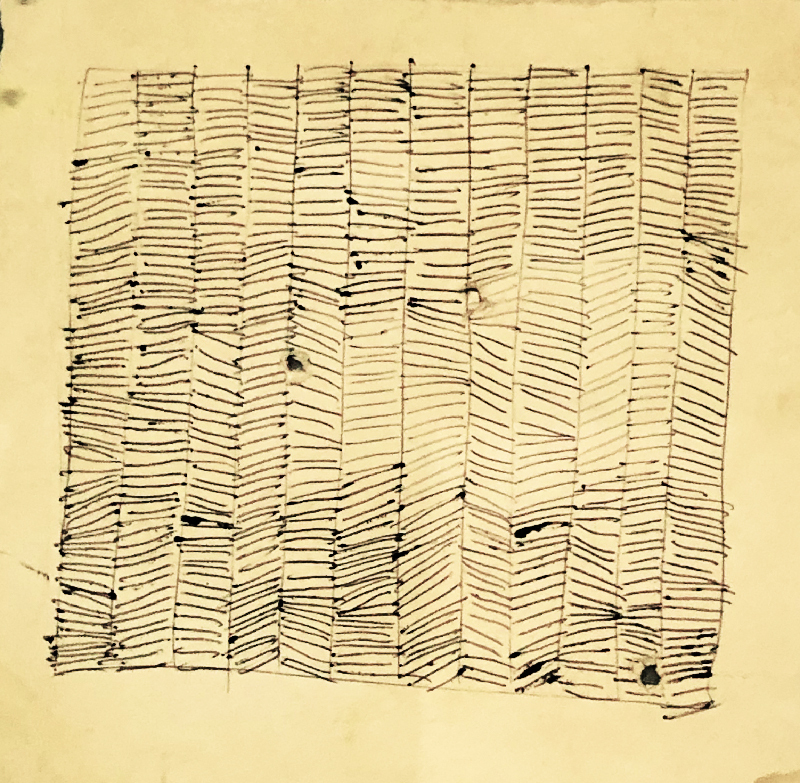 His small sketches resemble those of patchworkers and textile designers. 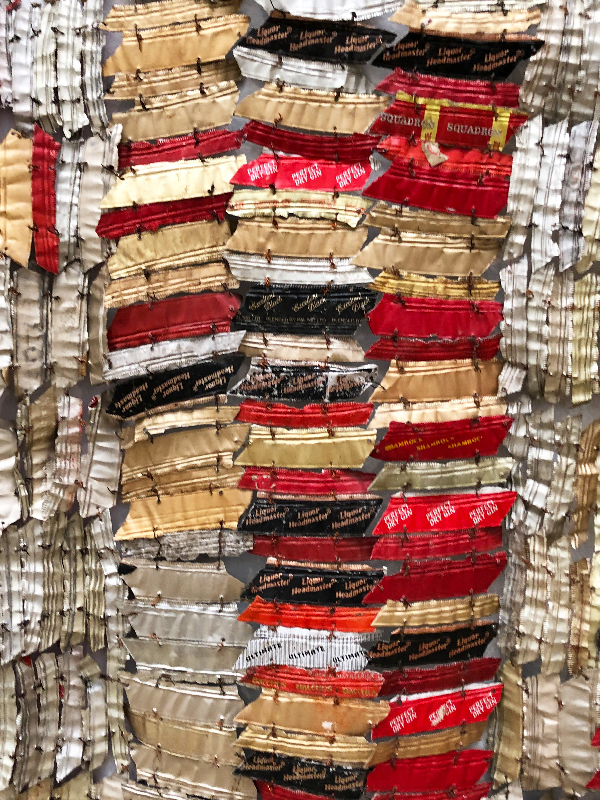 This is where El Anatsui practises assembling many small parts, using a great deal of rhythm and contrasts between light and dark. A treasure trove for textile designers! 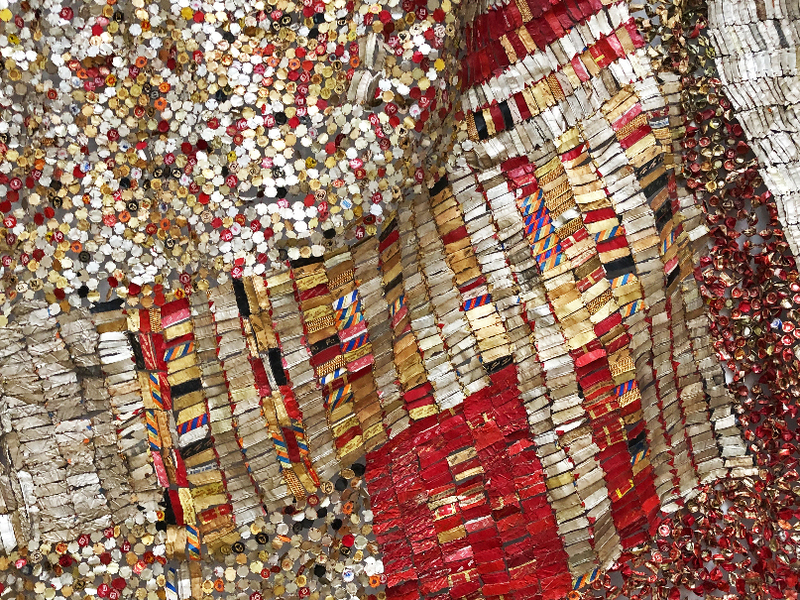 However, El Anatsui won his greatest accolades for his metal “cloths”, not his works in stone or wood. The 2007 Venice Biennial featured “Dusasa II”, a 2007 piece measuring 550 by 650 cm which was also on display in Munich. 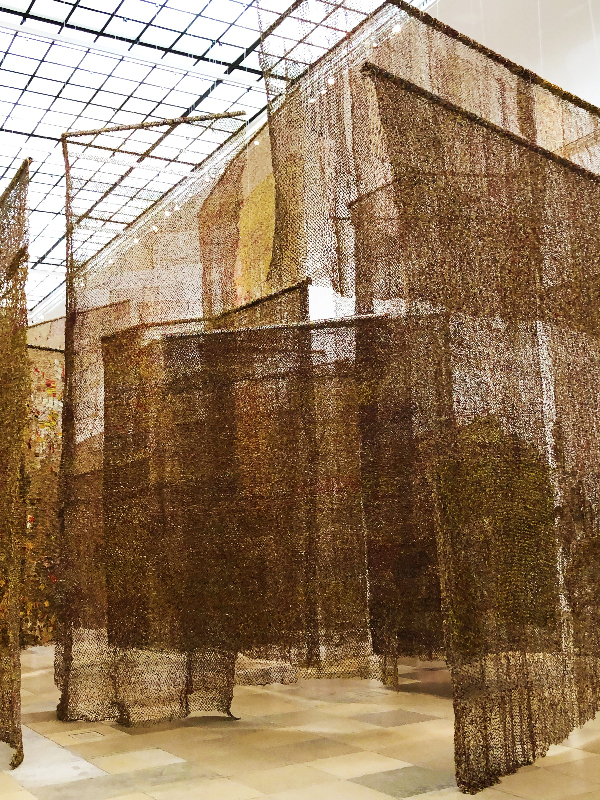 In addition, he designed a very large “fabric” installation for the façade of the Palazzo Fortuny. In 2015 he was awarded the Golden Lion in Venice for his life’s work. He will attend the Venice Biennale again in 2019, where he will be featured as a representative of Ghana, together with Ibrahin Mahama (whose work is also highly evocative of textiles). 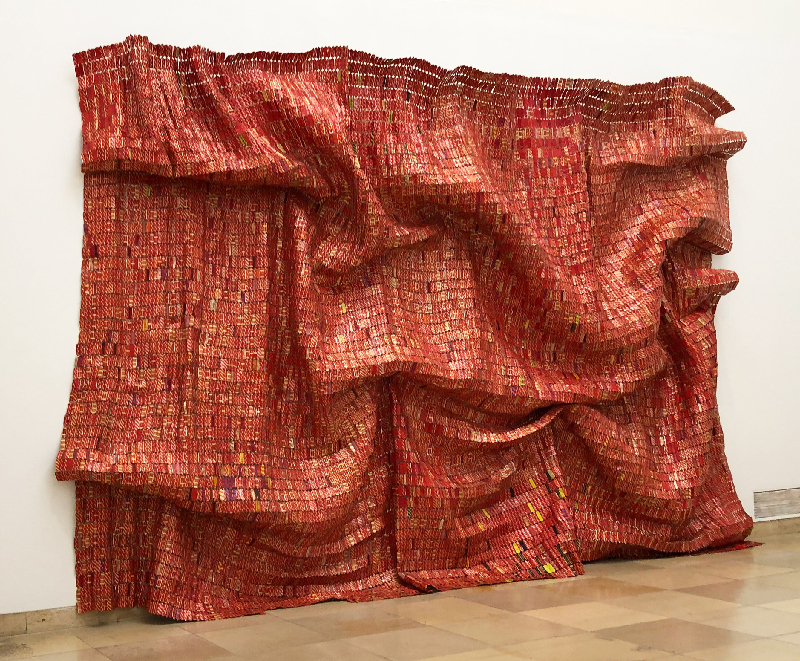 In addition to the above-mentioned “Logoligi”maze, El Anatsui created two more works specially for the Munich exhibition: “Rising Sea”, a piece covering an entire exhibition wall which makes reference to the global rise in sea levels, and “Second Wave”, an exterior installation on the southern wall of the museum and El Anatsui’s largest piece to date. 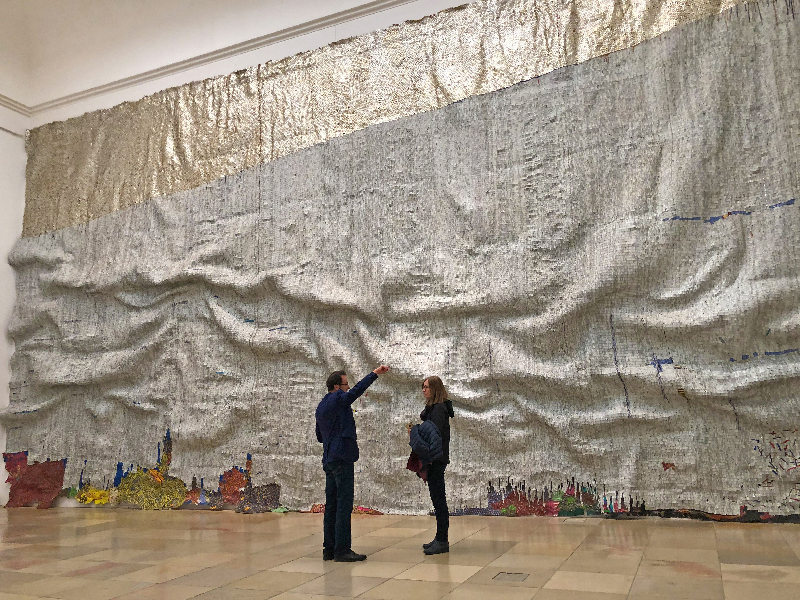 The artist conceived the idea for this installation after his first visit to Haus der Kunst in late 2017. He was inspired by Eisbachwelle, a Munich hotspot for river surfers, and by the “information age” we live in. 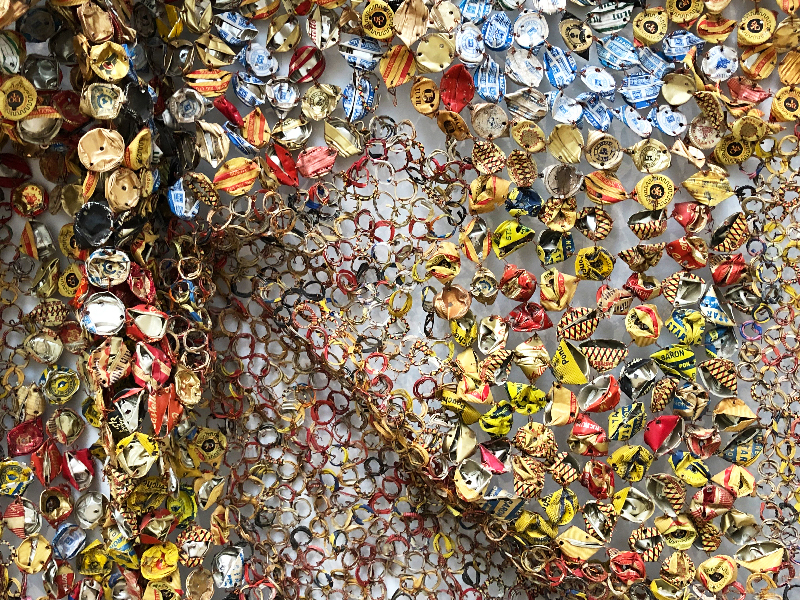 El Anatsui likes to work with waste materials, in this case some 10,000 offset printing plates! Unfortunately, I was unable to appreciate the piece properly due to adverse weather conditions. Then again, it failed to excite me from the start, and I am waiting for another opportunity to view it. 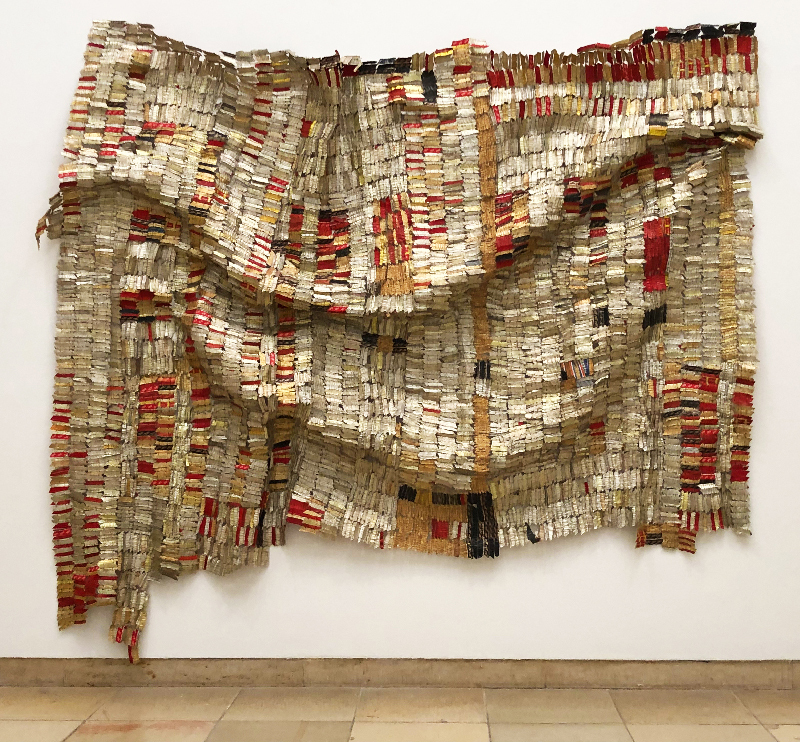 “El Anatsui – Triumphant Scale” will be on display in Munich until 28 July 2019. It will then travel to the Mathaf Arab Museum of Modern Art in Doha (1 October 2019 to 2 February 2020), the Museum of Fine Art in Bern (13 March to 21 June 2020) and the Guggenheim Museum in Bilbao (17 July to 1 November 2020). On 8 July 2019, Prestel of Munich will publish a catalogue with essays by Enwezor and Okeke Agulu, comprising 320 pages and 190 colour illustrations from the artist’s archive. ISBN 978-3-7913-5824-6, price: 49 Euros. An English edition will be published on the same date by Prestel, UK.